Dec09 CN Imaging/Sketching Contest Winner! FS102@f/6, astrodon 5nm Ha, Oiii, 3nm Sii filters, SX H9 camera. 10/6-11/8/09 Los Alamitos CA. bortle white skies. callibrated, combined, ddp, color balanced in maxim (balanced the white point on a pillar). microcurve for contrast, light local adaptive filtering and high pass filter applied to Ha in maxim. then to PS for luminance layering of Ha, adjustments to saturation and lightness. gradient removal in the Oiii channel. JPM's star removal action was used to adjust the star color: pink HST stars were replaced by more tradditional stars from a bicolor image. To all of you who took the time to stop by and vote for your favorite submission - thank you so much! Your participation really makes the contest! To all the contestants - every one of your submissions is worthy of winning. Congratulations to all of you on a job done very well indeed! bill w, congratulations on your win! Please contact me via PM with your t-shirt size and also the address where you want us to send it! Stunning shot Bill, many congrats. A very good shot, Bill. 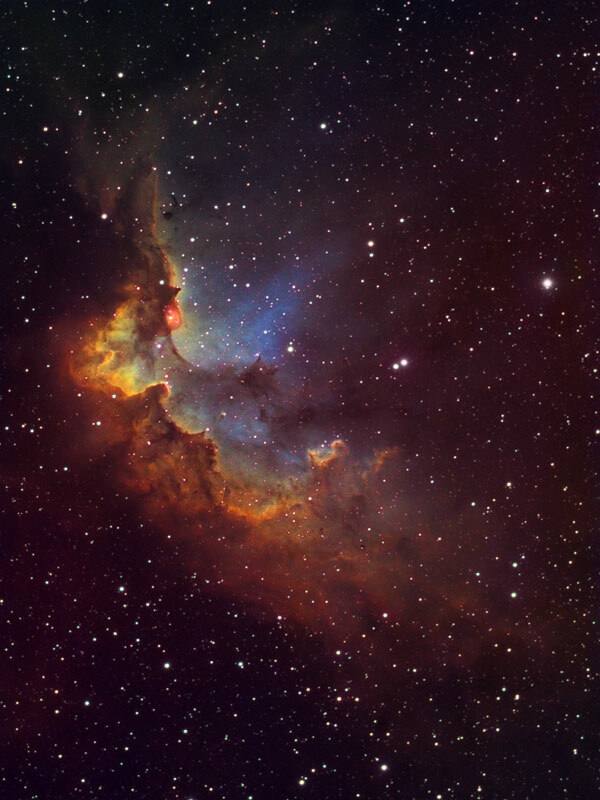 Congratulations on your win with your most beautiful photographic imaging of the Wizard Nebula. I noticed you mentioned the T-shirt. Do they really send us these for winning? I have won three times but never got the t-shirt. I have questioned it before but to no avail. I won the August contest. Just received my shirt 2 weeks ago. There have evidently been some issues with the T-shirts, but Mike is handling it personally now so I expect things will get better. Mark, I wish you had followed up with me, I assumed that since our last discussion you were all set. I'll point Mike in your direction. Absolutely beautiful. Who needs the Hubble? Dang!! That's a good one!! You most definitely deserve the prize!!!! Beautiful job Bill. The depth and dimension are astounding. You have some very nice shots on the site, especially liked the planetaries! Beautiful to look at! Why is this called the Wizard Nebula? I'm just looking at old threads today. I still did not know what to do to follow up back then. To this day I have won I think 4 times over the astro-photographers, and another 4,5, or is it 6 over the other sketchers. Theoretically I should have something like 10 T-shirts by now, but after questioning this years ago, then the entire sketch contest was stopped back then for a several month sabbatical until the T-shirt fiasco was apparently resolved. Is there a chance that someone at CN could just arrange to send me [one] T-shirt after 5 years waiting?